William Doherty has been a volunteer researcher at the Historical Society for years and has written many articles for South of the Mountains. Most notably, he transcribed a Civil War diary in the collections of the Historical Society and wrote about the diary and his search for the identity of the soldier. Bill also transcribed and wrote about the diaries of Minnie Torkler, the Rockland farmer and business woman who charmed our readers. He lives in West Haverstraw and is retired from commuting to a New York City career in real estate management. Judge Tompkins endorsed the publication, in 1929, of One Hundred Men of Rockland County, which contains full-page caricatures of prominent men of Rockland, drawn by Grand View resident and cartoonist William C. Morris. COVER PICTURE. 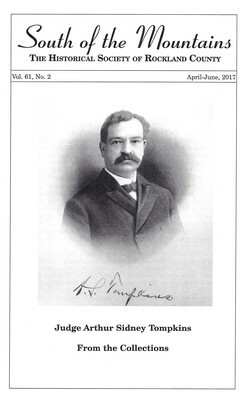 Image of Judge Arthur S. Tompkins, opposite the title page of Historical Record to the Close of the Nineteenth Century of Rockland County, New York (1902), edited by Arthur S. Tompkins. From the Collections of the Historical Society of Rockland County. © 2017 The Historical Society of Rockland County.